Recognize the source of the bottle below? If so, it might be functioning as a trademark, which is exactly what Bacardi is banking on given its recent federal trademark application for this bottle design. a bottle with a narrow neck which has a blue and white neck label with white geese imprinted on a blue band on the bottom of the neck label. 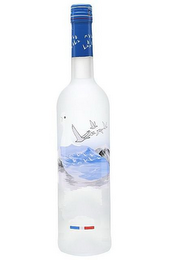 Centered on the front of the bottle is a silhouette of a large goose and several smaller geese behind and in front of the larger goose. These geese appear to be flying over a mountainous lake design which is generally blue with some white for shading purposes. There is a flock of white flying geese above the lake. Below the mark is a rectangle comprising a blue portion on the left, a red portion on the right, and a white portion in the middle. Can product designs or packaging function as trademarks? Yes, if they are (1) non-functional and (2) distinctive. TMEP 1202.02. In other words, the product design or packaging must not be essential to the use or purpose of the article or affect the cost or quality of it (i.e., non-functional) and, by its intrinsic nature, serve to identify a particular source (i.e., it is distinctive). See TMEP 1202.02(a)(iii)(A) and TMEP 1202.02(b)(i). Bacardi has had success registering bottle designs as trademarks in the past. For example, it owns a registration for the Grey Goose Le Melon bottle design and the Dewar's White Label bottle design, among others. In this case, however, Bacardi may need to clarify some things before it can obtain a registration. For example, is the Grey Goose design Bacardi seeks to register for a two-dimensional depiction of the bottle or for a three-dimensional bottle design? The USPTO asked Bacardi the same thing in an application Bacardi filed for a Bacardi rum bottle back in December 2017. Specifically, in that case the USPTO asked Bacardi to indicate whether the application was for a three-dimensional configuration of the goods or packaging or a specific design feature of the goods or packaging. Because the mark description for the Grey Goose bottle does not specify whether it is for a three-dimensional configuration, Bacardi may need to indicate as much again. According to my quick search, Bacardi & Company owns 197 active trademark applications or registrations with the USPTO, several of which are for bottle designs and/or bottle configurations (like this one for the Grey Goose VX bottle).